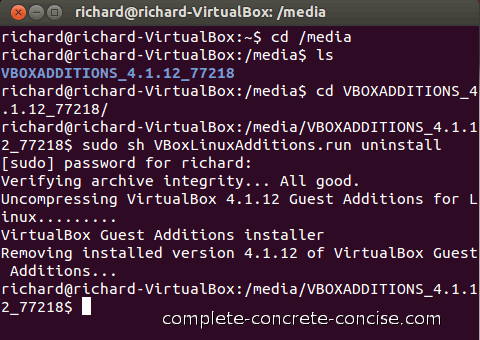 These instructions are for removing VirtualBox Guest Additions from Ubuntu 12.04 running under VirtualBox version 4.1.12. They may be the same or similar for other version combinations and other Linux distros, but no guarantee is made. Assumes you know how to open a terminal. Instructions for opening a terminal can be found here. Note: VBOXADDITONS_4.1.12_77218 depends on which version of VirtualBox you are running. The way I enter it is (1) type cd VB, then (2) press the Tab key to auto-complete the name. Note: Linux does not echo back your password. When you type your password, it looks like nothing is happening on screen. This is normal. Having uninstalled the VirtualBox Guest Additions, there is not much point in keeping the Guest Additions media installed.